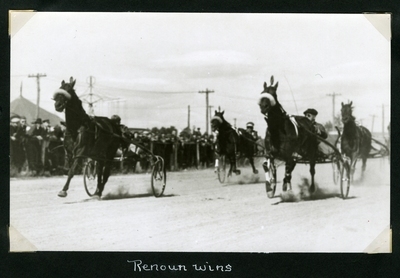 Black and white finish line photograph of black stallion, Renown [Renoun] winning the first heat of the 2.13 Pace on Friday, September 22, 1939 at Cumberland County Fair Grounds, West Cumberland, Maine. Bay mare, Dolly Yvonne finished in second place. Brown mare, Altamaha, finished in third.